Home » …She’s Off and Running! on September 17 | in Blog, Company Announcements, Local, Marketing, stationery stores | by karla | with Comments Off on …She’s Off and Running! Sky of Blue Cards bids adieu to Corinne Nelson today (super sad face!!). She is off and running and leaving us to pursue her education at the University of Oregon. I am so incredibly happy for her and excited that she has so much in the way of life experiences ahead of her. I can’t wait for her to get out there and begin this new chapter. Corinne has been working with me as my assistant since last January. She very quickly proved that she could do anything around here. I always describe her as pro-active; more often than not her sentences begin with the words “I went ahead and…” She organizes our studio with cute little labels, packages up merchandise, makes countless sales calls, writes orders, fills orders, and manages our inventory and customer relationship management software. Not to mention, she has definitely spent a lot of time making runs to our local FedEx office, Staples store, and to local stores whose owners look forward to seeing her smiling and friendly face come through their door with their orders. 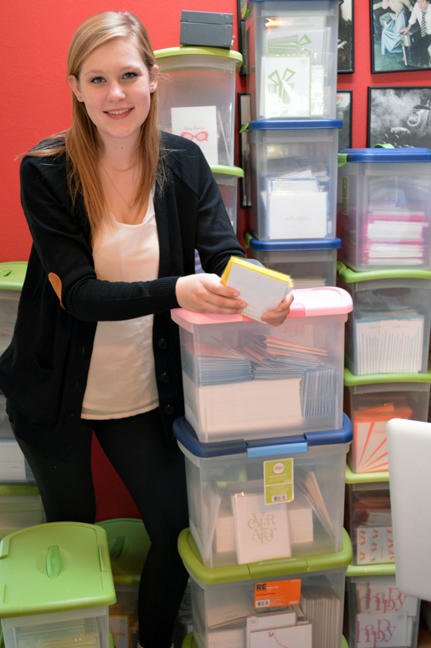 I’d be remiss if I did not mention how much hard work she put into getting us ready for the Stationery Show last spring. When I returned from New York she was as excited as I about our new accounts. The list of how she helps me is endless and she leaves behind big shoes to fill. But more than anything though, I will miss her sweet and energetic spirit in the studio every day.